Equity markets advanced during the first quarter as improving economic data supported gradually rising earnings. A steady and predictable path of anticipated rate increases this year by the Federal Reserve was well received by financial markets. Domestic equity indices ended positive for the first quarter of 2017. The Dow Jones Industrial Index was up 4.6%, the S&P 500 Index returned 5.5%, and the technology heavy Nasdaq ended the quarter with a 9.8% gain. Many believe that an underlying global recovery may be underway, leading to domestic equity demand here in the U.S. The Fed hiked short-term rates as expected in March, on track with two additional hikes in 2017 with improving economic data validating the Fed’s continuance of rate increases. The Fed has so far increased rates only three times in the past 16 months, one of its slowest paces ever. Fixed income analysts view the Fed’s decision to set two additional rate hikes in 2017 as a normalization of the interest rate environment, away from further accommodative policy producing low rates. President Trump’s political capabilities are being tested as he needs to substantiate that he can formalize legislative arrangements rather than business transactions. The inability to initiate a bill to repeal the Affordable Care Act (ACA) created uncertainty as to whether or not future legislative ambitions would prove more challenging. In addition to resuscitating a health care bill, tax reform is expected to be President Trump’s next objective, which many expect easier to tackle since lower taxes are a common theme among the divided Republican party. Two well respected measures of how consumers feel and how they perceive the economic environment showed dramatic increases in their most recent data. The Consumer Confidence Index, compiled by the Conference Board, and the Consumer Sentiment Index, prepared by the University of Michigan, both elevated to record levels. Since consumer expenditures make up nearly 70% of Gross Domestic Production (GDP), growing confidence among consumers is deemed optimistic by economists. 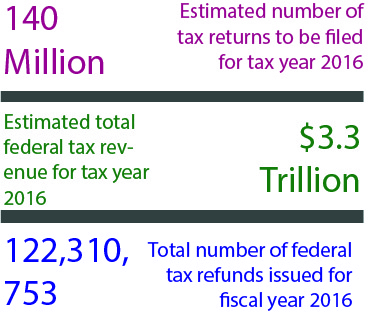 With tax season underway, estimates from the IRS show that over 140 million tax returns will be filed for the 2016 tax year with over $3.3 trillion in federal tax revenue.